This crazy, funny show sets heroines from the 19th-century novels of Louisa May Alcott, Jane Austen and the Bronte sisters, in a mythical place of Moors. When our heroines receive proposals of marriage, they decide to escape. The men wage war on the women starting the Moors Wars. Jaclyn Backhaus’ ultimately moving and inventive play ends in beautiful prose like a chapter from the books these women originated. Directed by Devon de Mayo. Jaclyn Backhausis a playwright and co-founder of Fresh Ground Pepper. The Hypocrites’ production of YOU ON THE MOORS NOW is her Chicago debut. 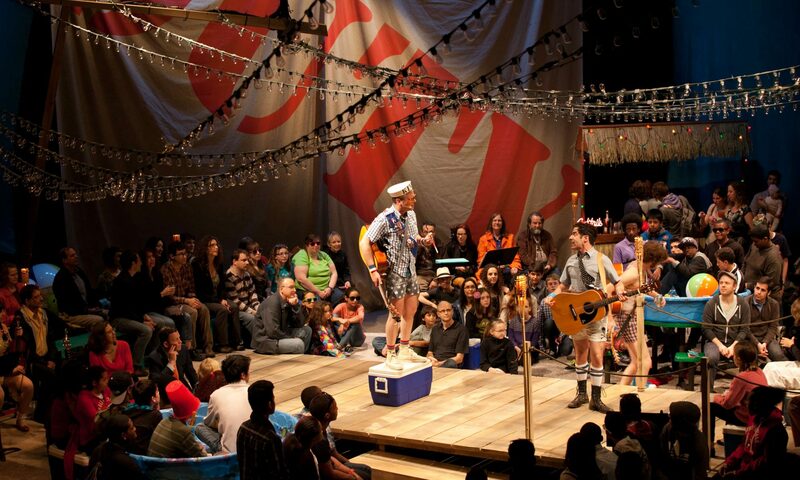 Her play MEN ON BOATS was a NYT Critics’ Pick for its production in Clubbed Thumb’s Summerworks, as well as a Kilroys play in 2015. It will be remounted at Playwrights Horizons this year and receive its Chicago premiere at ATC in 2017. Other works include PEOPLE DOING MATH LIVE! (Under The Radar Festival’s INCOMING! Series at The Public Theater), THE INCREDIBLE FOX SISTERS (Live Source, The New Ohio), and YOU ON THE MOORS NOW (Theater Reconstruction Ensemble, NYC). She has received commissions from Playwrights Horizons and Ars Nova and is the 2016 Tow Foundation Playwright-in-Residence at Clubbed Thumb. Her work has been developed and showcased with the Bonnaroo Music and Arts Festival, Playwrights Horizons, The Public and Joe’s Pub, The Ice Factory Festival, (not just) 3 New Plays, The Civilians R&D Group, SPACE on Ryder Farm, Ars Nova’s ANTFest, and The Falcons. BFA: NYU. She hails from Phoenix, Arizona.